When Chris and I were planning our trip to Isle of Islay, we knew we wanted to explore as much of the island as possible in addition to visiting the various distilleries. 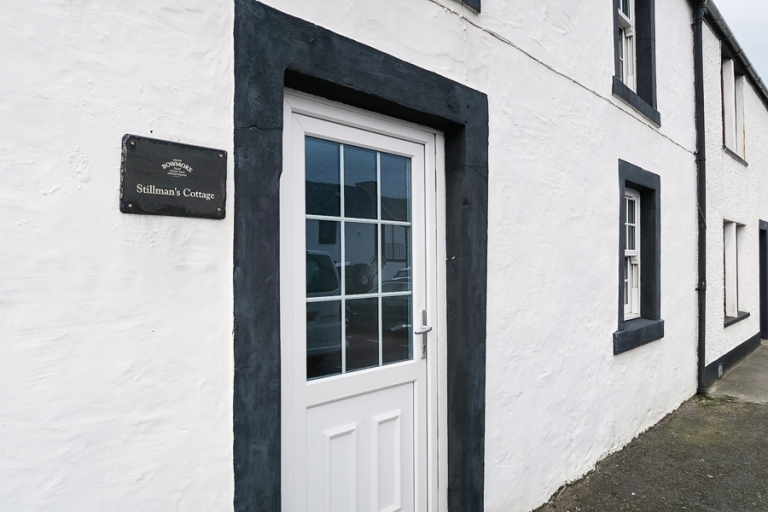 I figured that the town of Bowmore would serve as a good centralized location, and my accommodations research landed me on the Bowmore Distillery Cottages website. 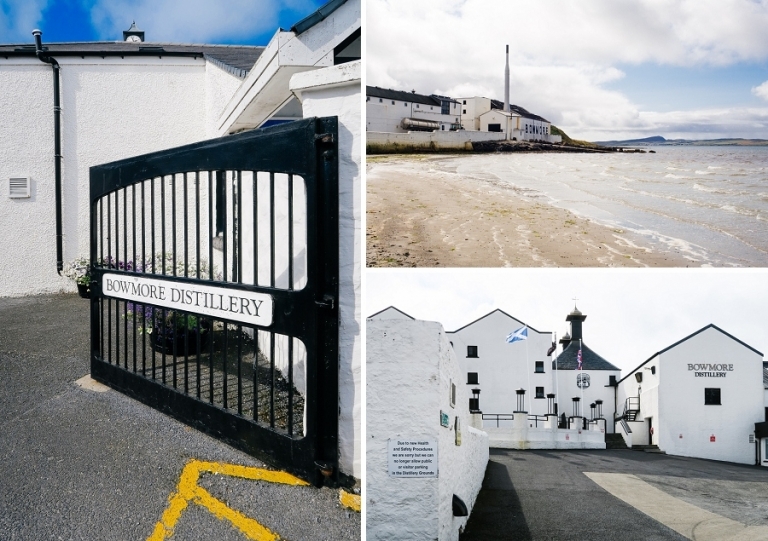 Bowmore Distillery, the oldest distillery on Islay, sits on the shore of Loch Indaal in the heart of Bowmore town, and they have their own set of six self-catering cottages for the perfect place to base an Islay adventure. We love self-catering options and I found tons of glowing reviews for the cottages, so I decided to book Stillman’s Cottage. I’m glad we stayed there because we absolutely loved it. We found the cottage cozy, clean, peaceful, and practical. 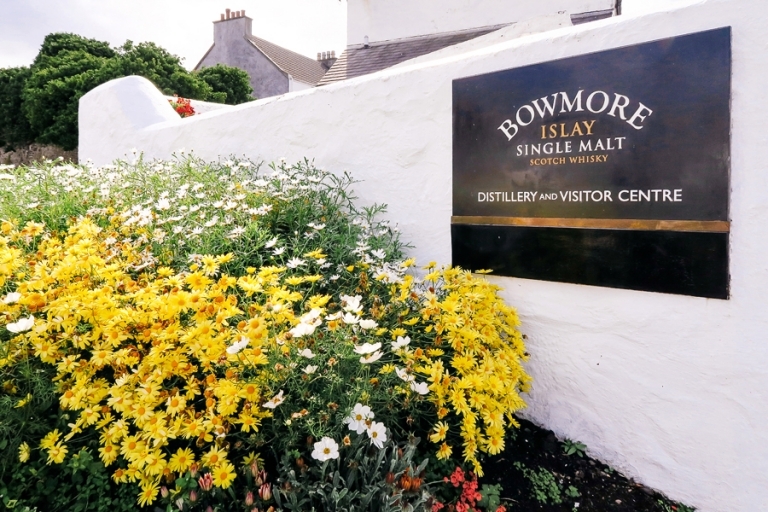 Plus it was just steps from Bowmore Distillery, making it super easy to visit their tasting room. There aren’t a lot of photos of the cottage on the Bowmore website, so I’m posting a few more images here in case it’s helpful to anyone interested in Stillman’s. Our journey to Islay (flight, road trip, and ferry) put our arrival past regular check-in hours, but the after-hours key pick-up system was simple and convenient. We were provided with the code to a lockbox where we retrieved the keys with no issues. We did have a little trouble locating our cottage at first, but we found it after running up and down the streets of Bowmore for a few minutes. All of the buildings are white and look the same! 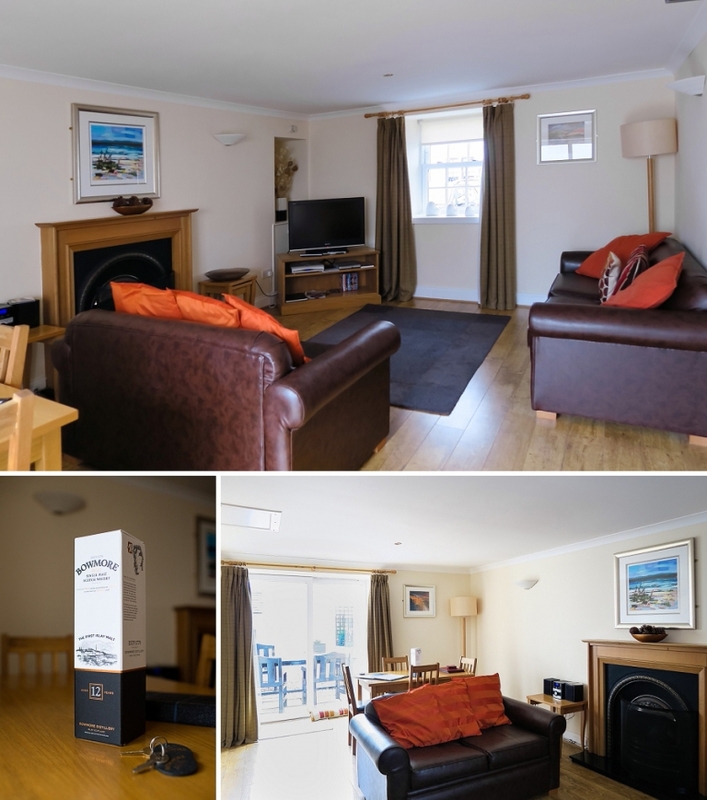 There are several cottages at Bowmore, and ours was located on Main Street, conveniently across from a Chinese take-away restaurant, a hotel restaurant and bar, and just a short block away from a pharmacy and a grocery store. Plenty of parking spots line the front of the building and we never had any issues with finding a spot. When you enter the front door, there is a small foyer, a half-bath to the left (not pictured) and a gorgeous map of Islay on the wall to help you plot out your island adventures. A carpeted staircase leads to the upper level where you’ll find two bedrooms and two bathrooms. The door straight ahead leads to the kitchen, and the door to the right opens to the living room/dining room. It was a little different (to us) having a door on the kitchen and living room, but my best guess is that this provides extra fire safety. One of Chris’s favorite things about Bowmore was that our cottage came with a complimentary bottle of Bowmore 12-Year. We also found a yummy whisky tablet (candy, similar to fudge) waiting for us as well. The small movie library included a copy of The Angel’s Share on DVD and we watched it one evening in the comfy living room. The movie was good fun, especially considering our location. The kitchen provided everything we needed to prepare and enjoy a few meals. A small refrigerator is hiding in the corner there, but it was plenty of room for our Chinese take-away leftovers and some breakfast items. We made use of the combo washer/dryer a couple of times, which was one of the reasons I specifically wanted Stillman’s Cottage. We didn’t go outside to the garden patio since it was a bit chilly during our visit, but I can imagine it would be a nice spot for enjoying a coffee or a dram. 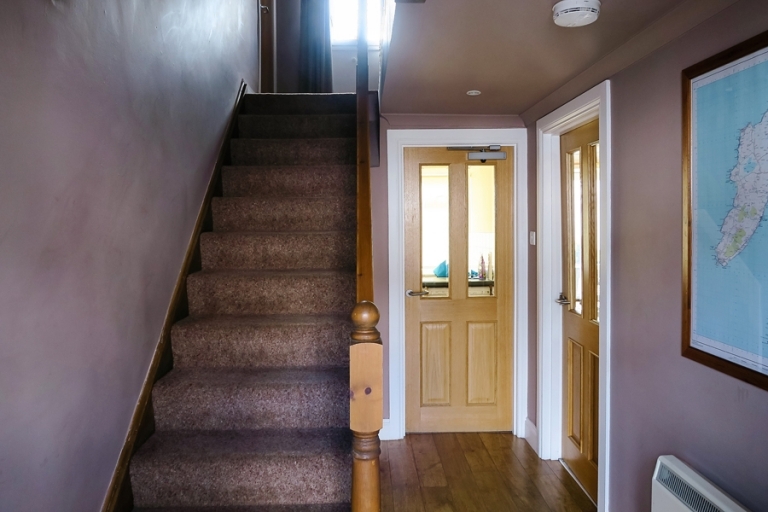 The second floor holds two bedrooms each with an en suite bathroom. We slept so well in the incredibly comfortable master bedroom and enjoyed the spacious master bathroom with the best water pressure in the shower that I’ve ever experienced while traveling. We didn’t need to use the second bedroom with the twin beds (I didn’t post photos of the second bathroom), but this cottage would be perfect for two couples or a family. Plenty of space and privacy. We loved staying at Bowmore Cottages and wouldn’t hesitate to book Stillman’s Cottage again in the future. In fact, Chris is already dreaming about going back someday soon. Let me know if you plan to stay at Bowmore and if you have any questions! And just a note: I wasn’t compensated to post about Bowmore Distillery Cottages or asked to do so – we simply enjoyed it that much! Plus I had a hard time finding pictures, so I wanted to help. Enjoy! Susan - Hi Rob! I highly recommend the Water to Whisky Experience at Laphroaig if you can swing it! It’s the ultimate tour experience and we absolutely loved it. Other than that, we just did the Lagavulin tour (which was great, though they don’t allow photography), and only did tastings at the rest. Most things actually shut down pretty early in general, but the daytime activities make up for it, and you’ll get to enjoy a bottle back at your Bowmore cottage in the evening. Have a wonderful trip!